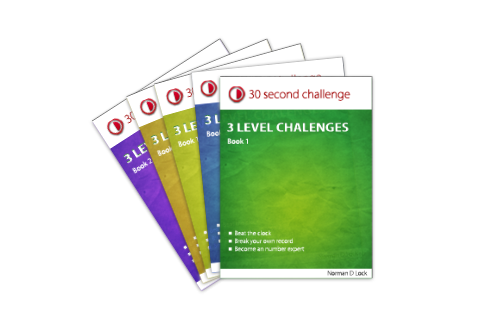 Welcome to 30 Second Challenge. You have taken the first step in becoming a number expert. 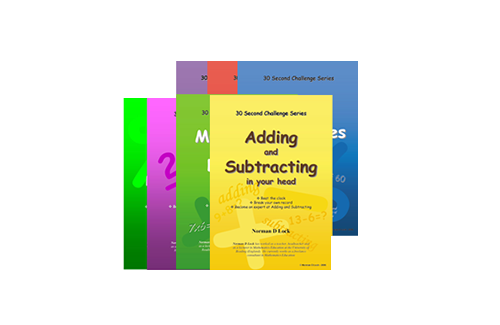 These mental mathematics challenges will transform your arithmetic skills and help develop your memory and speed at manipulating numbers. 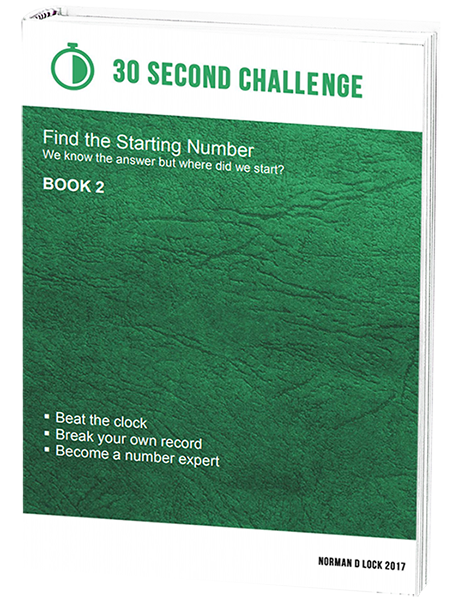 The 30 Second Challenge APP perfectly complements the e-books in developing your number skills. It is suitable for all ages and abilities. Enjoy and have fun! 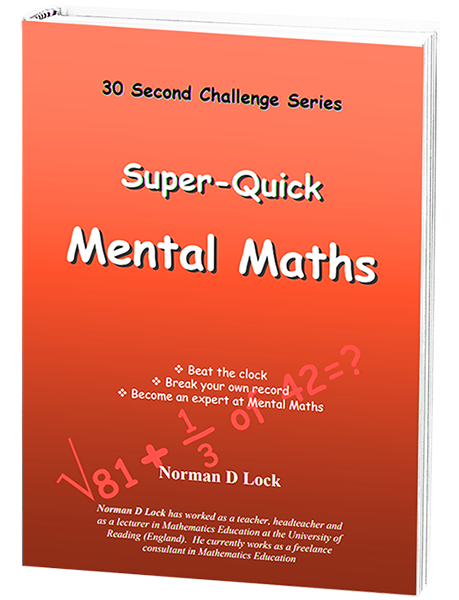 Whether you are learning for the first time or blowing away the cobwebs these books will really help you know your times tables, understand and use fractions, percentages and other fundamental mathematical skills. 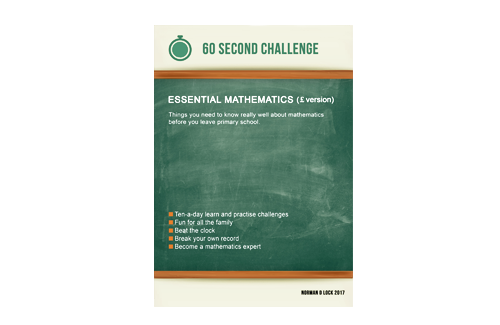 This book helps you learn and practice all you need to know about the fundamental ideas of mathematics. It builds your knowledge base step by step and gives you daily practise at trying them out. This learn and practice book helps you know about the fundamental ideas of mathematics. It builds your knowledge base step by step and gives you daily practise at trying them out. It coverage a wide range of topics including: time, the calendar, money, shape, and the measurement of weight, length and capacity. Number skills feature prominently with challenges and tips on addition, subtraction, multiplication and division, as well as fractions, percentages, averages, odd and even numbers, positive and negative numbers, squares and square roots and prime numbers. 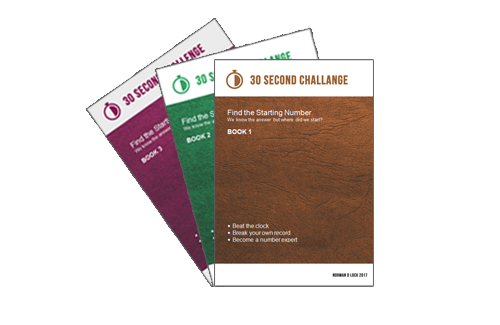 The 30 Second Challenge materials are intended for individual use. 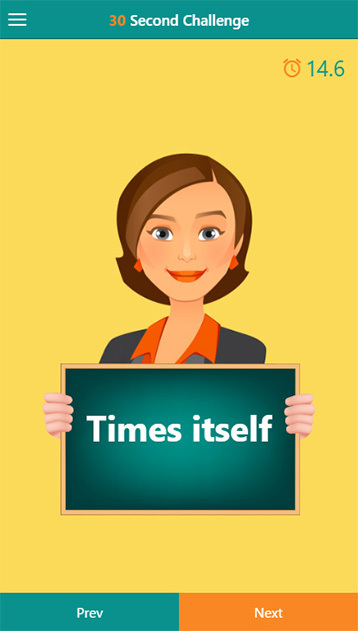 However, they are perfect for use by schools and colleges with students. The education institution would need to purchase a School Licence. These number skill starter books ensure you know your times tables and number bonds, while helping you learn about fractions, percentages, square roots etc, giving you a solid foundation for handling numbers easily. 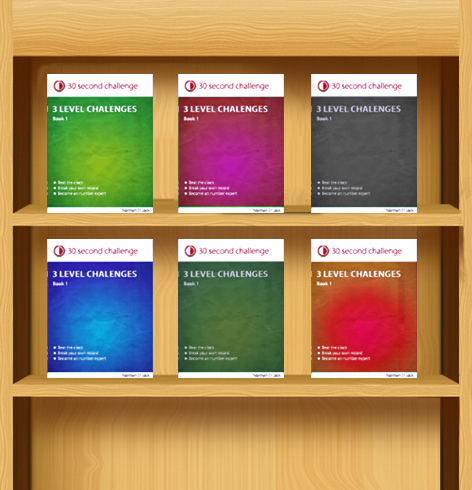 These are the very popular brain training books that are for all ages and abilities from Beginners to Intermediate to Advanced. They have the format used in the newspapers. You follow number trails which lead you to the answer at the end using the skills learned from the earlier starter books. These books are different. They turn the 30 Second Challenges on their head! You see a short number trail and you are given the answer. You have to calculate where you started! They go from easy to interesting! 30 Second Challenge has now an APP. You can now play your favourite mind training game wherever you are on your mobile devices. 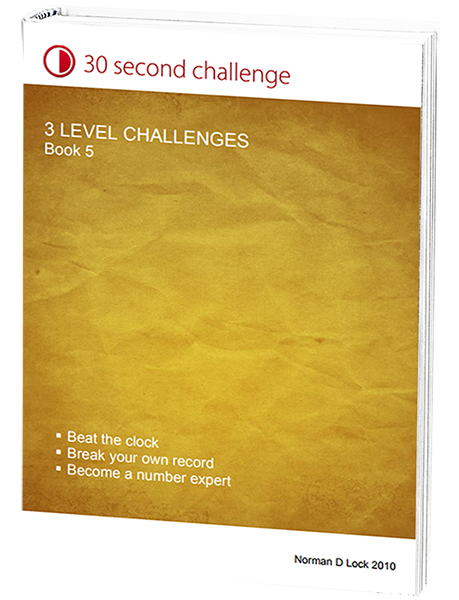 There are three levels to play at: BEGINNER, INTERMEDIATE and ADVANCED and there are three characters to give you the challenges. As you take each challenge the timer records your progress. At the end of each one, you enter your answer and the APP tells you if your answer is correct and how long you took to complete it. Remember to concentrate on getting the right answers. Your speed will improve the more you practise. This APP is perfect to develop your number skills. It is suitable for all ages and abilities. © 30 Second Challenge. All Rights Reserved.